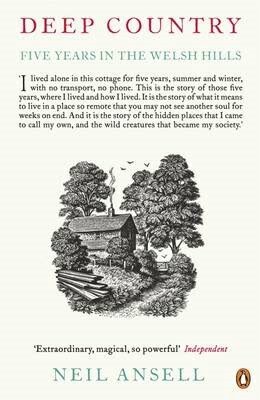 I read with great pleasure this lovely book by Neil Ansell about his five years living alone, with birds, bats and beasts, in an remote cottage in the Welsh hills. Gently, spaciously written, with fine knowledge and perception of the natural world and of birds especially, this takes you right there - it's wonderful. As I began to read, though, I found myself wishing that he'd shared a little of what he'd been doing before, what took a thirty-year-old man to this isolated, basic rural life, why he stayed there for five years and why he left. Then: a quiet corrective. I'd been looking for the wrong things.
" Solitude did not breed introspection, quite the reverse. My days were spent outside, immersed in nature, watching. I saw as much as I did because of two things: the first, quite simply, was time, the long hours spent out in the field; the second was alertness, a state of heightened attentiveness. My attention was constantly focused away from myself and on to the natural world around me. And my nights were spent sitting in front of the log fire, aimlessly turning a log from time to time and staring at the flickering flames. I would not be thinking of the day just gone; the day was done. And I would not be planning tomorrow; tomorrow would take care of itself. The silence outside was reflected by a growing silence within. Any interior monologue quietened to a whisper, then faded away entirely. I have never practised meditation, but there is a goal in Buddhist practice of achieving a condition of no-mind, a state of being free of thought, and I seemed to have found my way there by accident. I certainly learned to be at ease with myself in the years I spent at Penlan, but it was not by knowing myself better - it was by forgetting I was there. I had become a part of the landscape, a stone." How short this brought me up before my own sharp and constant self-consciousness. I was reminded of how much this is a product of displacement, how one might aspire not to a happier self-consciousness, but to less of it.
" When I read my notebooks now I can see a dramatic change taking place from beginning to end. For the first year, it is a fairly straightforward diary, an account of where I went, what I did, and how I felt. By the second year it is strictly a nature journal: a record of my sightings and perhaps some notes on the weather. And by the third year it is virtually an almanac: arrival dates for spring and sutumn migrants; nesting records; perhaps interspersed with an occasional piece of prose capturing a fragmentary moment, say a description of the flight of a single bird. I have disappeared entirely from my own narrative; my ego has dissoved into the mist. I came to the hills to find myself, and ended up losing myself instead. And that was immeasurably better. " "To study the way is to study the self. To study the self is to forget the self. To forget the self is to be enlightened by all things of the universe..." Dogen Zenji (1200-1243), Japanese Buddhist teacher and founder of Soto Zen, oft quoted by Reb Anderson. Here's a brief video of Neil Ansell at Penlan. In a way perhaps this detracts from the book: his words convey it all so well - a more subtle, open conveying. But knowing the video is there, it seemed a shame not to share it. 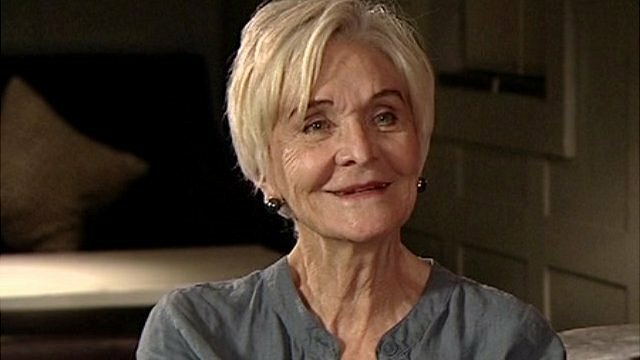 BBC five-minute video interview with a favourite actor, Sheila Hancock - beautiful, lovely, talented woman, still getting better. Watching this just... made me feel happy. At the London College of Communication. What kind of idiot stands in the middle of the street to take a photo?... mmm, it is very quiet on Sunday afternoon. When young I was stiff and impatient, on journeys, in queues. At the smallest sensation of being subjected to anything, there was a reflex to object. Then at, oh, around forty I began to feel tired. Stiff and impatient gave way to spaced out in queues and sleeping on trains and planes... and to nodding off at the hairdressers, previously a prime site of anxious irritation. There'd been pride, as well as discomfort, in the stiffness; in the growing weariness there was resignation and, almost, humiliation. All these years later, it no longer shocks and mostly no longer shames me, but I always notice, as I noticed just the other day the relief and gratitude I felt at being subject to a series of young women messing with my hair. Relief because this was remission from my seesaw life between the constant, rigid willpower needed to keep working all day and the plunge, each time it's over, into isolation and lack of structure. I wished the quiet, impersonal ministrations, gently filling time and space, would go on for a long, long time. What do the words have to do with the pictures? The velvet tablecloth induced a similar feeling, I think: I wanted to just lay my head down on it and stay there (in a busy street, so not really an option). A photo of mine has been published on qarrtsiluni (I escaped from my desk for a couple of days so only just found out that this was up). I think qarrtsiluni's fabulous, had a few things accepted in the early years but not for a long time, so this is very gratifying. The current issue theme of Imitation is throwing up some wonderfully enjoyable stuff, of which this is surely my favourite. As I was titling and posting this photo, Terrance Keenan's book, St Nadie [St Nobody] in Winter came into my mind. Moments later I saw that the latest in the weekly series of interviews with creative people on the Writing Our Way Home blog is with none other than this Zen priest, poet and artist who has moved me so much. St Nadie is a searing treasure of a book of poetry, wisdom and honesty that has really stayed with me - read it! Sunday is a snow day spent at home, the unaccustomed cold and quiet outside the window a disconcerting echo of my cold, quiet mind inexorably rehearsing present fear and future scenarios of destitution. Hours and hours of this before I'm able to remind myself that actually I don't much want what society tells me I must want and am stupidly putting at such risk. Well, I want it a bit, of course, don't hate stuff, some stuff: clothes, for example, furniture - their shapes and colours, a kind of art; or digital toys for grown-ups, the hardware and software of on-tap words and music. But they haven't proved much comfort, really, in the face of tedium and alienation. The stuff I most want is not for sale: fresh air on my face, an unpaved path for wandering and soil to dig in; a quiet place and time to explore meditation; community, communion with others who dissent. Such a small space these have been squeezed into and now, whilst not crazy enough to completely disdain realism, I need to hook them back up and hold them close, embrace more radical priorities, let the realism be a bit more magical.